A Westlock man’s charity cross-country bike trip fundraiser, is back on the road after his bike was stolen in Winnipeg on July 7. “I was about 100 kilometres from Kenora and my wife met me. 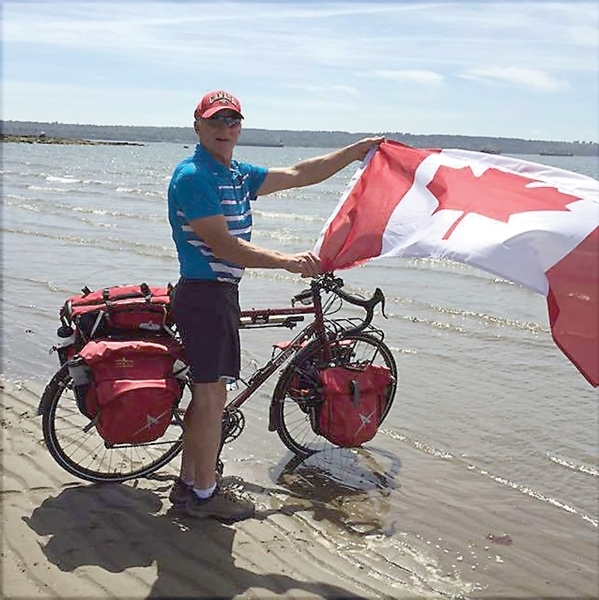 I was going to take a couple days rest and we went back to Winnipeg to get a hotel room,” said the 57-year-old Carnegie, whose cross-country odyssey is raising money for the Heart and Stroke foundation. “It got stolen off the bike rack on the vehicle. It was locked up and they cut the locks off and stole it. Before the hold-up Carnegie said he was making great time. Carnegie has a fundraising goal of $20,000 for Heart and Stroke and has raised $10,330 so far. Other than the theft, Carnegie said he’s having a fun time on his journey. “It’s been good. I had some hot weather in southern Saskatchewan, a couple of 35 degree days, but nothing that would stop you from cycling,” he said. After starting in Vancouver on June 17, Carnegie trekked through Pentiction and then up to Revelstoke. He passed through Calgary and then zigzagged across the Prairies, making a stop at Medicine Hat and then popping through Regina until stopping in Winnipeg. He plans to take the highway around the Great Lakes, and stop off in Thunder Bay and before heading to the coast. He has a new bike from Edmonton that was delivered to Kenora, Ont., on July 9 and he is now back on the road and continuing his journey.